Cuba's state-run media has strongly criticized Call of Duty: Black Ops for portraying an attempted assassination of Fidel Castro, claiming that it glorifies illegal behavior and encourages "sociopathic attitudes" in youth. Cuba's relationship with the United States has been famously contentious since a young Fidel Castro led a band of Marxist revolutionaries to overthrow the government in the late 50s. Attempts by the CIA to assassinate Castro - more than 600 times, according to some reports - haven't helped smooth those waters over the years. It's not terribly surprising, then, that the Cuban government would be a little touchy about a videogame that turns that messy history into mainstream entertainment. 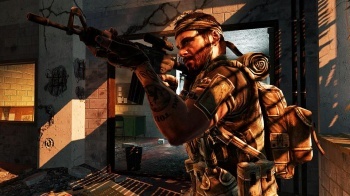 "What the United States couldn't accomplish in more than 50 years, they are now trying to do virtually," an article on the state-run news site Cubadebate says, referring to an early Black Ops mission in which players battle their way through the streets of Havana in an attempt to kill Castro shortly after his takeover. "This new video game is doubly perverse," it continues. "On the one hand, it glorifies the illegal assassination attempts the United States government planned against the Cuban leader... and on the other, it stimulates sociopathic attitudes in North American children and adolescents." It's an understandably sore spot, but Texas A&M psychology professor Christopher Ferguson said the article's claim that studies have shown a link between violent gaming and anti-social behavior is incorrect. Saying that there's a lot of "rhetoric and politics going on," he pointed out that while videogaming is more popular than ever as mainstream entertainment, violence among youth in the United States "is at its lowest level in 40 years." Even though it's been more than five decades since Castro's revolution, during which time the U.S. has normalized relations with old foes like the Soviet Union, China and Vietnam, it still maintains a strict trade and travel embargo against Cuba. Castro, now 84 and frail but still the head of the Cuban Communist Party, said in 1998 that he's survived so many attempts on his life that when he does actually die, nobody will believe it.